It’s as much about language as the music. Poet in da Corner focuses on the grounding that grime – in particularly Dizzee Rascal’s seminal debut album Boy in da Corner – gave to the identity and career of creator and performer Debris Stevenson. Dyslexic, raised in a strict Mormon household and struggling with both friends and finishing Matilda, Debris has grime broken down for her by a classmate and it lets something in her go free. As she gets older, though, and manages to escape the vague area “between East London and Essex”, she turns increasingly to the question of who exactly gets to be “set free” by their mastery of words. She anticipates and addresses criticism on this front from the start, in fact, via the conceit that the same friend who introduced her to grime, SS Vyper (played by the MC Jammz), attends the show and interrupts from the audience. As he’s enfolded into what happens, he accuses Stevenson of commandeering a form and profiting from her whiteness, while also helping in this recounting of their shared past. Boy in da Corner is the prism through which Stevenson’s semi-fictionalised early life can be examined. Tracks are reupholstered (by Michael ‘Mikey J’ Asante) with her own hooks, samples of her voice alongside straight up playing of Dizzee’s material to speak to aspects of her adolescence. ‘Jezebel’, for instance, gives structure to a scene examining the sexual attitude of her male friends and her own confused attraction towards a “Jeze” girl. 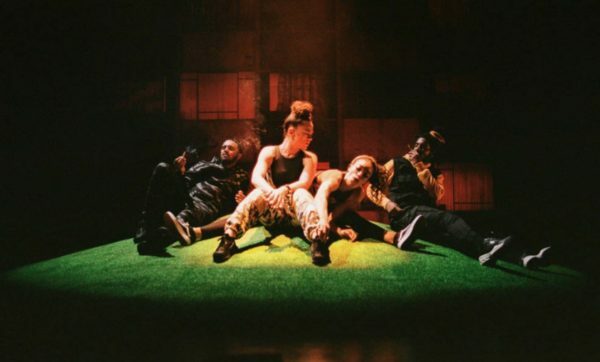 Despite references to Rinse, Radar FM and Form 696, knowledge of grime isn’t required to enjoy the show – the production plays classics recognisable even to this reviewer, and exuberant performances from the small cast carry the show forward with charm. As Vyper, Jammz handles his conflicting reluctant, resentful or proud moments with ease and his bars (fittingly, for the show) outshine Stevenson’s at points, while Kirubel Belay and Cassie Clare act as all other roles as well as DJs and hypemen in turn. As Debris’s mother, Clare is a creepy standout, snapping instantly into an almost painfully upright posture and menacingly “proper” smile. Stevenson herself, using language to surprising, disarming effect (for example, a boy sat on her doorstep is “shiny Pokémon rare”) holds herself like the uncertain yet defiant child she apparently was. Jacob Hughes’ design is wasp-sharp, down to the black and yellow streetwear (easy to move in, thank god, as move they do) worn by all the performers besides Jammz, who wears just black. The glossy black and yellow set, replete with DJ booth, adapts according to what Debris’s remembrances need: a grassy knoll, a housing estate backdrop with shadows of hanging laundry, and enormous neon crucifixes, despite the Mormon lack of enthusiasm for them. The movement (choreographed by Aaron Sillis and Shanika Wallace, with “Krump consulting” from Dominant) is always playful, especially at the point where Debris remembers her first sexual experiences with a girl from school, Kemi. She begins to move alone, supporting herself one-handed close to the floor, lit by a mixture of slow red and blue strobe, and it makes for a moment of strange stillness and solemnity. Ola Ince’s direction knows when to draw out something like this and when to go full-pelt for the silliness, and treads the line between these delicately. Held through traded verses, this discussion is pointed throughout the performance. Vyper repeatedly asks Debris what she’ll do to remunerate him for what he sees as theft, then desertion. Then Debris gives him the floor to end the show, and he delivers. It’s funny to see certain members of the Royal Court audience – including me, to be honest – encouraged to stand and gunfinger in the air. The play can’t provide the answers to this issue of overstepping boundaries and paying tribute where it’s due, even though its end appears to be an offering of sorts. We’re back to arguing over credits, over starring roles vs. ‘featuring’, to the team behind and the face at the forefront. I don’t have the answers, either, but I do wonder how much addressing we can allow art to do when the focus of a piece is still on a certain demographic in particular, and their lives, and their experiences. Theatre’s collaborative, and of course this work isn’t all about Stevenson, and yet at the same time it kind of is, at the end of it. How much do we allow self-awareness to count? Is it time to expect more? Whichever side you come down on, let me know, and try to have some fun at the same time. Poet in da Corner is a pretty good bet for that. Poet in da Corner is on until 6 October 2018 at the Royal Court. Click here for more details.